While this quote of Donald Trump, President of the United States of America, may be true, you should never succumb to failure, and you should always prepare for success and success alone. 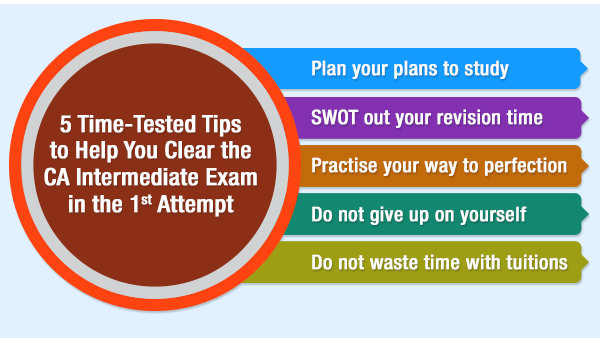 It is neither impossible nor too ambitious of you to want to clear your CA Intermediate exam in the first attempt. Having said that, one must remember that the journey of CA students entails a steep climb, and the road is long. It will take months of dedication, tonnes of effort and a winning strategy. So are you ready to grit your teeth and bite the bullet? No, not literally of course! But are you ready to give up on your play time and gear up for all the hard work? If your answer to that is an emphatic ‘Hell, yes!’, then we have all the means necessary to guide you. The journey of becoming a CA comes with certain dos and don’ts. Here, we have five simple yet effective tips that will help you achieve your goals. 1. Plan your plans to study – And, plan it really well. Most students prepare only for the imminent exams, but you should go about planning your study schedule with just as much effort. Sit with yourself for some quality me time. Are you an early morning bird or a nocturnal owl? Depending on your preference, save your theory lessons for a time when your mind is the least pre-occupied. Switch off your cellphone and keep other distracting gadgets at bay during your study hours. While pouring out dedication by the truckload, do not forget to plan your breaks. Disengage for 15–20 minutes every two hours and allow your brain the cooling time it needs before you get back to your books again. 2. SWOT out your revision time – Imagine your brain functioning like a pressure cooker during your preparatory days. With all the steam boiling up inside, it is going to let out some of it at some point in time to make room for some more. Only in the case of your brain, don’t let it slip out some really hard-learned lessons from your CA syllabus. Hence, it’s important to go back a few steps and revise. Do a SWOT analysis to identify your Achilles’ heel and work on making it your strength. 3. Practise your way to perfection – While theory is the foundation, concepts resemble the building you build on it. Practise and practise till all concepts come alive in the eye of your mind. Befriend your practice manual, and make sample papers and mock test papers the bible to swear by; also pore over previous year questions papers with complete dedication. Learning concepts is one thing and presenting them on paper is another. Presentation is one of the most important factors that will either make or mar your CA Intermediate examinations. It is important to be able to arrange your answers in layers. While practising, try to arrange your answers to talk about the provision fast, then your interpretation of the same, followed by the connection between the case in point and the provision you just discussed, and end your answer with a befitting conclusion. Do not forget to top it all with a good heading. 4. Do not give up on yourself – As is the case with all other battles of life, so it is with your CA Intermediate preparation: belief is key. Lack that, and it can become a major impediment on your road to success. Every time you doubt yourself, you take one step away from success. If that continues to be the case, all the preparation in the world will not be able to get you back on track. With exceeding expectations from self and the environment, it is easy to succumb but do not let the stress overwhelm you. After all, the CA journey, just like life, is nothing but a journey of faith. 5. Do not waste time with tuitions – Time to a CA Intermediate student must be a lot more important than all the treasures of the world put together. Time is neither too scarce nor is it too abundant. You have about just enough time to put all your efforts together, and you can’t afford to lose any of it. Not even to and from or during your tuition classes. Personal mentoring is of utmost importance to a CA Intermediate student, but now there is a whole new way of approaching a mentor. YouTube is teeming with preparatory videos, and live classes are gaining in popularity, just like a hurricane gains momentum. And there is a good reason why! Let’s hear it straight from a ranker, shall we? Check out this video [link] to watch All India CA Topper (May ’17) Raj Sheth share his CA journey. It is truly inspiring to see him smitten with the glory of his success as he shares some important tips and tricks of his own. And who knows? Yours may be the next face to claim the fame of being an AIR! It is all there within you. All you need to do is believe. For the rest, you can lean on us. CAprep18 is here to help you achieve a case-study calibre success in your CA Intermediate exam!